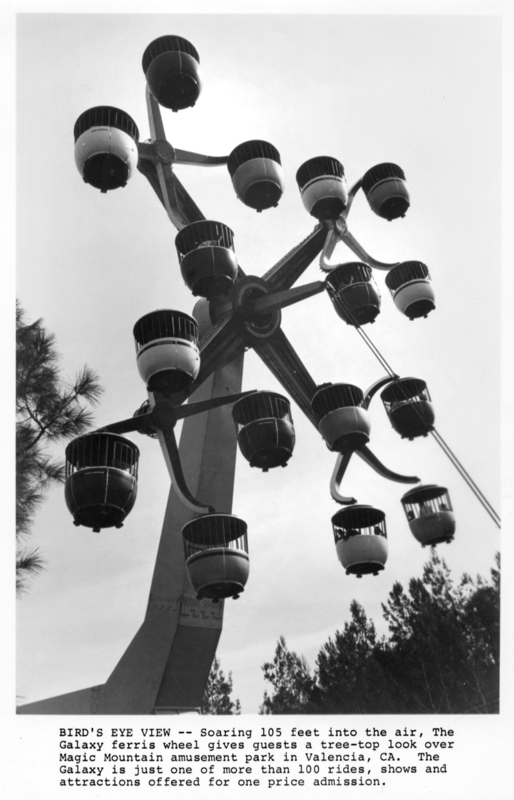 In an era of A-through-E-ticket rides at Disneyland and separately ticketed rides at carnivals and county fairs, offering universal access to all rides for the price of a single admission ticket was a novel concept and one which Magic Mountain exploited in its marketing program when the park opened in 1971, as seen in the caption to this early promotional photograph of the Galaxy ride. BIRD'S EYE VIEW — Soaring 105 feet into the air, The Galaxy ferris wheel gives guests a tree-top look over Magic Mountain amusement park in Valencia, CA. The Galaxy is just one of more than 100 rides, shows and attractions offered for one price admission. LW2775: 19200 dpi jpeg from original photograph purchased 2015 by Leon Worden.